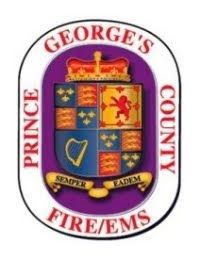 Prince George’s County Firefighters battled an intense fire at a Capitol Heights house this morning that threatened to ignite neighbor’s homes on both sides. At about 4:00 am, Tuesday, May 10, 2011, fire/EMS units arrived at a 2-story house at 722 Mentor Avenue to find heavy fire conditions on both floors. Four occupants escaped the house safely prior to the Fire/EMS Department arrival. Due to the extreme fire conditions firefighters were unable to make an interior attack on the fire and remained outside in a defensive exterior position. One of the primary concerns for firefighters was to protect the structures on both sides as the radiant heat threatened to damage and ignite those as well. Additional firefighters were called to the scene to assist the first arriving firefighters with controlling the fire. It required over an hour to knock down the bulk of the fire. The house of origin is a total loss, however, firefighters were successful in protecting the neighbors homes. There is one person that occasionally resides in the house along with the four occupants. It in not known if he was in the house or not when the fire occurred this morning. Attempts to locate him by traditional means have been unsuccessful. Until contact is made and he is determined safe, he will be considered unaccounted for. Fire Investigators are on location searching the structure and the cause is under investigation. Fire loss estimates are still being tabulated. The Fire/EMS Departments Citizen Services Unit is assisting the four occupants, as they will be displaced. There were no civilian or firefighter injuries reported, however, a dog did perish in the fire.. Updated information will be provided as soon as it becomes available.